LG Electronics (LG) unveiled a bracelet LG Lifeband Touch and headphones LG Heart Rate, two wearable products, two LG fitness gadgets, which mark the company’s entry into the technological products for fitness. Both products were discovered at the Consumer Electronics Show CES in Las Vegas, and embody the comfortable design and compatibility with other devices. Thus, monitoring of one’s health condition requires no extra effort – it is only necessary to put a bracelet on hand and headphones in the ears. Lifeband Touch is a smart companion for activities, bold design and is compatible with heart rate monitors and smart phones. At the same time, the design of innovative handset LG Heart Rate allows you measurement of heart rate during exercise. Both devices, thus, help users to take greater control over their health, and they can also wirelessly connect to each other, thus creating the supporting ecosystem. By linking with smart phones (which run Android or iOS) devices can transmit data to an intuitive, easy application LG Fitness or to those of other manufacturers such as applications MyFitnessPal, RunKeeper and MapMyFitness. Bracelet Lifeband Touch is designed to be asymmetric and flexible providing greater comfort and style compared to other fitness bracelets . INCLUDES OLED touch screen to display the time , biometric data , incoming calls and control music . Built- in 3 -axis accelerometer , and altimeter allow accurate measurement of key indicators such as distance, speed , number of steps , calories burned and pace anticipated . All these information are visible by dragging your finger on the OLED screen . Designed to be lightweight and easy to use, and the bracelet contains a unique algorithm to detect movement that automatically turns the screen , in a turn of the wrist . Lifeband Touch also offers connectivity via Bluetooth to transfer data to a smart phone or receive data from other devices such as headsets Heart Rate . These LG’s headphones for measuring the heart rate, using sensor technology PerformTek ® which measures blood flow signals in the inner part of the ear in order to get information about the work of the heart and the maximum oxygen consumption. The flexible design of the handset makes it more comfortable than similar devices for monitoring, and a clip-on supplement is used for the Bluetooth connection, or sending data to a smart phone or a bracelet Lifeband Touch. 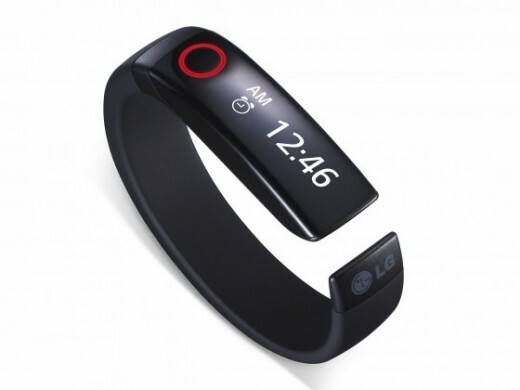 LG fitness gadgets, and headphones Heart Rate will be available in the U.S. in the first half of 2014., And later also on the other markets.